Paul Rolly Leah Hogsten | The Salt Lake Tribune Utah Highway Patrol Trooper Terry Buck investigates the scene of a DUI where a near empty bottle of vodka was found in the vehicle, October 31, 2014. The driver was given a intoxilyzer test to determine her blood alcohol content that showed she was twice the legal limit at .166. About 160 additional UHP troopers participated in the Halloween DUI blitz to remove impaired drivers from Utah roads. Leah Hogsten | The Salt Lake Tribune Utah Highway Patrol Trooper Terry Buck investigates the scene of a DUI where a near empty bottle of vodka was found in the vehicle, October 31, 2014. Leah Hogsten | The Salt Lake Tribune Utah Highway Patrol Trooper Terry Buck questions a driver about his erratic and dangerous driving while exiting the interstate in October 2014. 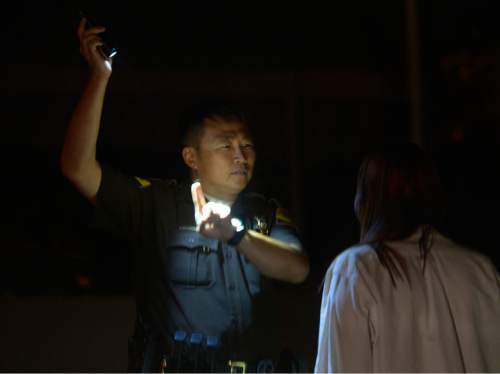 Leah Hogsten | The Salt Lake Tribune Utah Highway Patrol Trooper Terry Buck gives an impaired driver a sobriety test October 31, 2014. Leah Hogsten | The Salt Lake Tribune Utah Highway Patrol Trooper Terry Buck gives an impaired driver a sobriety test October 31, 2014. The driver was given a intoxilyzer test to determine her blood alcohol content that showed she was twice the legal limit at .166. About 160 additional UHP troopers participated in the Halloween DUI blitz to remove impaired drivers from Utah roads. But when the 32-year-old Murray woman veered across three lanes to turn right on Highland Drive, Utah Highway Patrol Trooper Terry Buck was a block west of her, traveling east on 3900 South and decided he needed to check out the erratic driving. 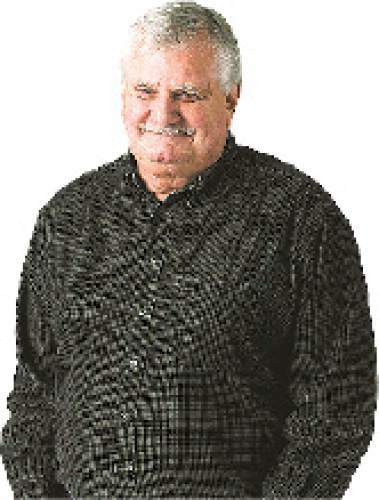 He caught up with her as she was pulling into an empty day-care center parking lot on Highland Drive, and a man was approaching her truck. Buck wasn&apos;t sure what awaited him  with another party walking toward the driver  so he called for backup. The man, it turned out, had been called by the woman who decided she was too drunk to drive after she got behind the wheel. She was out looking for him as he was walking and, when she spotted him, the trooper had witnessed her reckless driving. She almost fell getting out of the truck and acknowledged drinking a half a fifth of vodka. She told the trooper she knew she was drunk, but she thought if she was honest and cooperative, he would get somebody to drive her home and let her off with a warning. As it became clear she would be arrested, she became belligerent, alternatively begging and threatening Buck, who remained calm and professional. "You don&apos;t have to take me to jail," she pleaded. "You can take me home. Nobody will know. My uncle is a Davis County deputy sheriff, so I know. You don&apos;t have to take me to jail." She repeated that argument dozens of times while Buck patiently and persistently put her through field-sobriety exercises and eventually persuaded her to blow into a Breathalyzer. She blew a 0.16, twice the legal blood alcohol limit for drivers. It was 11:15 p.m. on Friday. This drunken motorist became one of 33 DUI arrests in Salt Lake County during the UHP&apos;s Halloween DUI blitz, with about 40 troopers participating. Tribune photographer Leah Hogsten and I were invited to witness the sweep and were assigned to Buck&apos;s car. We sat quietly for two hours while the woman verbally abused the trooper, telling him she would sue him. "I&apos;ll have your badge. I&apos;ll have your pension," she warned. "You&apos;ll have nothing." 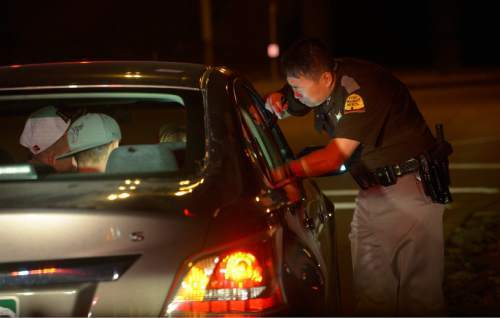 On a typical weekend night, 10 to 15 troopers will be on patrol, and about a half dozen DUI busts will be made in Salt Lake County, said UHP spokesman Todd Royce. 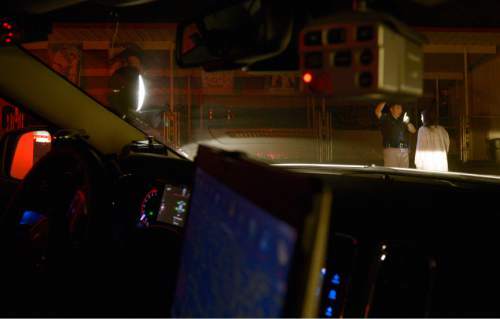 But on designated holidays  Halloween, New Year&apos;s Eve, Memorial Day, Labor Day and Independence Day  the UHP conducts a statewide blitz, bringing in about four times as many troopers, who volunteer for the overtime shifts. This past weekend, 160 additional troopers, working five-hour shifts, were on the street looking for drunken drivers. "The most encouraging statistic from last night," Royce said Saturday, "is that while we had 33 DUI arrests, we have had no reports of alcohol-related accidents or fatalities." That&apos;s why Buck insisted that he did have to take the woman to jail  despite her pleas and protests. At a 9 p.m. briefing at UHP&apos;s Murray office  before the troopers hit the road  Col. Daniel Fuhr, the UHP commander, told the group that every drunken driver removed from the street represents a potential life (or lives saved), including those of the arrested motorists themselves. 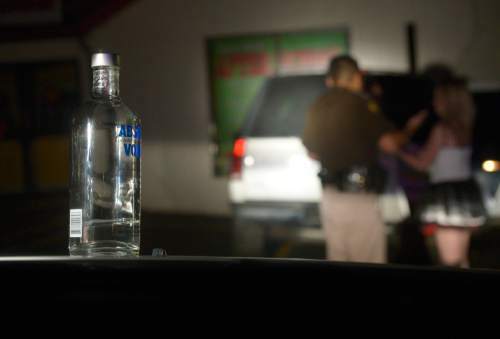 He cited a troubling statistic  discussed at a recent legislative committee meeting  that while DUI arrests fell by 11 percent (from 12,227 in fiscal 2013 to 10,901 in fiscal 2014) the number of DUI-related fatalities has been rising. The latest figures show that alcohol-related traffic fatalities increased from 20 in calendar 2012 to 23 in 2013. The number of traffic fatalities caused by drugs jumped from 37 to 45. Much of that could be blamed on budgets. Debbie Johnson, legislative liaison for the Department of Public Safety, explained that, due to budgets set by the Legislature, the UHP had only four more troopers in 2010 than it had in 1980. During that time, the number of cars on the road and vehicle miles traveled shot up by 50 percent. Sen. Daniel Thatcher, R-West Valley City, was one of five legislators who went on the Halloween night ride-alongs. As co-chairman of the budget committee that oversees the UHP and other criminal-justice agencies, Thatcher has participated in nearly every UHP DUI blitz during his four years in the Senate. He said he has labored to increase the number of troopers. Johnson cites stats that show 19 troopers have been added since 2012. "The biggest reason I go [on the blitzes]," Thatcher said, "is to make sure those people putting their lives on the line to keep us safe know that we appreciate how dangerous a DUI shift can be." On Friday, he rode with Trooper Chris Dunn, whose fingers were severed two years ago, when he was struck by a car that zipped past barricades while he was assisting a motorist on the shoulder of Interstate 15. Thatcher said the woman Dunn arrested Friday also was angry. "But the way she was driving, she could have ended up dead," he said. "She barreled through a narrow street at high speeds where people were taking their kids trick-or-treating." The other legislators who participated Friday were Rep. Steve Eliason, R-Sandy, Rep. David Lifferth, R-Eagle Mountain, Rep. Douglas Sagers, R-Tooele, and Rep. Angela Romero, D-Salt Lake City, who hopes to be appointed to the House Law Enforcement and Criminal Justice Committee next session. "I want to understand not only how the laws and policies we put in place impact the community," she said, "but [how they] impact those who go out and do the job every day, the first responders."